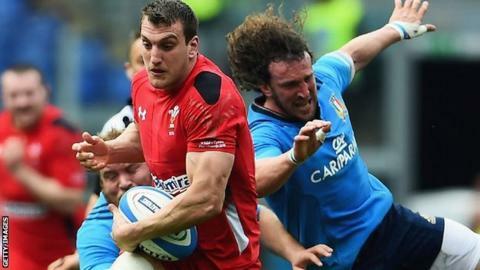 Sam Warburton believes Wales are fitter now than they were ahead of the last World Cup. Wales finished fourth in 2011 after losing 9-8 to France in the semi-final. Warren Gatland's team were lauded for their fitness as well as their performances in that tournament and captain Warburton claims the team is further advanced this year. "We are in a better place physically. I think we started off from a better place from day one anyway," he said. "We probably got to the fitness levels that we were at in 2011 a couple of weeks ago and we've got a nice three-week block now until Ireland and we've still got to go up [a level] again." Gareth Charles reports from Switzerland as Wales' rugby players are put through their paces ahead of the 2015 World Cup. Wales have been on summer training camps in Switzerland, Qatar and north Wales. Warburton was among a large number of senior players who were left out of the squad for the warm-up match against Ireland in Cardiff on 8 August. The Welsh play Ireland again in Dublin on 29 August before Gatland reduces his squad from 38 to 31 on 31 August. Wales looked rusty in the 35-21 defeat against Ireland, but Warburton says they are now concentrating on rugby after spending a tough summer working on fitness and conditioning. "It's just making sure that from a rugby perspective now we get the rugby as good if not better [than 2011]," said Warburton. "I thought we were playing some great stuff towards the end of the  Six Nations. "We felt very comfortable playing together so it's about getting that cohesion back by the time the World Cup starts." Wales finished in third place in the Six Nations - pipped on points difference by Ireland and England in spite of beating Italy 61-20 on the final Saturday of the season. The World Cup kicks off on 18 September when England face Fiji in Twickenham in Pool A.
Wales are also in Pool A along with Australia and Uruguay. Gatland's team kick off against Uruguay at the Millennium Stadium on Sunday, 20 September.